Darius Pliskauskas celebrates the winning penalty shot for Phantoms against Basingstoke. Photo: Alan Storer. Sporting conclusions simply do not come any more dramatic than that provided by Peterborough Phantoms last night (October 11). Lithuanian wizard Darius Pliskauskas thundered in a final-second equaliser before tucking away the decisive penalty shot as the city team delivered an incredible turnaround to triumph 2-1 over fellow English Premier League high-flyers Basingstoke. Phantoms netminder Janis Auzins is struck from behind by Basinsgtoke's Ryan Watt. Photo: Alan Storer. It was the sort of thing that had to be seen to be believed. 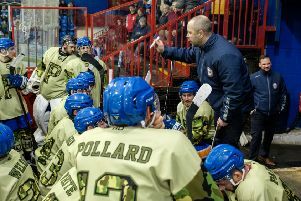 A Phantoms side, undeservedly trailing after being unable to turn torrents of pressure into goals, were staring down the barrel of defeat in a top-of-the-table showdown at Planet Ice. But, from a face-off with three seconds remaining on the clock, came an astonishing twist. Ales Padelek won the puck-drop and guided it back to Pliskauskas who unleashed the most ferocious of shots which flew past Bison netminder Tomas Hiadlovsky at 59:59. Five breathless minutes of overtime then passed without a further breakthrough before Pliskauskas also proved to be Phantoms’ hero in the shoot-out. He tucked away their second effort to earn victory while netminder Janis Auzins ruled supreme at the other end of the ice to keep out Tomas Karpov, Joe Rand and Ciaran Long. The late drama completed a third four-point weekend out of five in the new season which leaves Phantoms joint-top alongside Milton Keynes, but they already boast two games in hand on their fierce rivals. Coach Slava Koulikov said: “That is why we always tell the guys to play for the full 60 minutes! “It was an incredible game of hockey. Basingstoke played well in the first part of the game, but we were then the better team and only a fantastic performance from their netminder kept them ahead for so long. “We never stopped believing we could score. We pulled Janis to give ourselves the extra skater and we got the goal in the end. “To score with a second to go was such a great feeling which spread throughout the team and the fans. The collision of two styles had made for a terrific clash last night even before the late drama. Basingstoke adopted their customary tactics of attempting to incite and rile with former Phantoms man Alan Lack twice taking penalties for leaving Auzins on the deck. The visitors were out-shot in all three periods but were always threatening and a powerplay goal - scored 27 seconds before the mid-point of the match by Aaron Connolly after a Shaun Thompson effort from a tight angle had dribbled agonisingly along the goal-line – gave them an advantage to defend. Phantoms did everything but score as they effectively set up camp in the Bison zone and peppered the target only to encounter a netminder in inspired form. Slovakian ace Hiadlovsky had been hopeless when the Bison were beaten at Planet Ice in the opening weekend of the new season, but last night he delivered the sort of performance befitting a man whose CV features top-level experience in his homeland and the UK. He dealt with all 49 shots unleashed on his target until being powerless to prevent Pliskauskas’ devastating last-gasp blow from flashing into the top corner. He was also beaten by the same player’s penalty shot and reacted to Basingstoke’s defeat by stomping back to the locker room to a chorus of boos. Hiadlovsky took no part in the post-game handshakes and was not present to collect his man-of-the-match accolade while Phantoms were left to lap up the adulation of their fans following another weekend to savour. They face two struggling teams this weekend as a Saturday trip to Sheffield Steeldogs (October 17) is followed by a Sunday visit from ailing champions Telford.